ABC drama returned to Thursdays. ABC: GREY’S ANATOMY returned from a break that started on November 15, up 0.2 to 1.9. A MILLION LITTLE THINGS, heavily promoted during GREY’S, rose 0.4 from its last airing on Wednesday December 12 to 1.1 (down 0.1 from the last STATION 19 in its new slot). HOW TO GET AWAY WITH MURDER, off since November 15, was down 0.1 to 0.7. 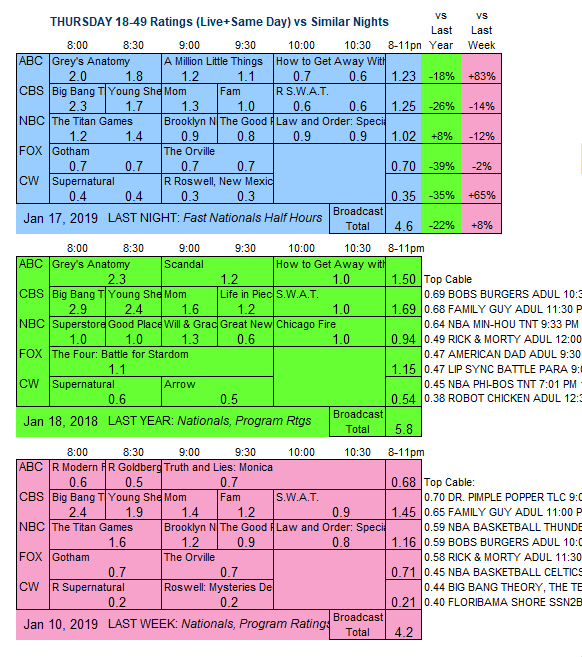 NBC: THE TITAN GAMES fell 0.3 to 1.3, and BROOKLYN NINE-NINE dropped 0.3 to 0.9. THE GOOD PLACE lost 0.1 to 0.8, while SVU was up 0.1 to 0.9. CBS: THE BIG BANG THEORY slipped 0.1 to 2.3, and YOUNG SHELDON was down 0.2 to 1.7. MOM dropped 0.1 to 1.3, and FAM fell 0.2 to 1.0. A SWAT rerun ended the night at 0.6. FOX: GOTHAM and THE ORVILLE were both steady at 0.7/0.7. 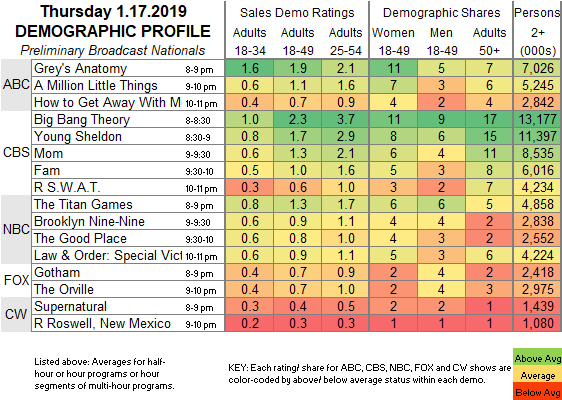 CW: SUPERNATURAL aired for the first time since December 13, steady at 0.4. A rerun of the ROSWELL, NEW MEXICO pilot was down 0.1 from the initial airing to 0.3. DYNASTY returns to CW tonight.